passionate about the Sedona market where she lives and sells; she is ethical, attentive, and committed to helping buyers, sellers and investors achieve their goals in this magical luxury market. Lynne started her real estate career, Sedona Lifestyle Properties, in 2003 to provide clients with concierge full service. Her unique synergy of HONESTY–CARE-COMPETENCE are the hallmarks of her success. Rarely do you find an agent who combines unrivaled client service with in-depth market knowledge, savvy negotiating, innovative marketing and a command of technology – all the more reason why Lynne is so highly recognized and referred. She works with a team of professionals who provide staging, digital imaging and marketing to optimize a seller’s home on 360+ of the most popular home search websites nationwide, and to over 600,000 international agents. 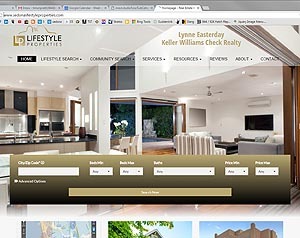 Lynne also syndicates her listings to 90+ top global websites in their native tongue! Equally dedicated to buyers from throughout the U.S. and the world, Lynne feels heartfelt joy and satisfaction in finding the perfect Sedona lifestyle property for her clients, no matter which brokerage has listed it. A native of Omaha, NE, Lynne learned about customer service and entrepreneurialism at a young age working at her father’s retail children’s store business. After earning her Master’s in Education and Counseling, she founded and was president of a private rehabilitation firm where she helped the injured and served as a highly qualified expert witness where honesty and competence were paramount. Her education, business and counseling experience led Lynne to excel in real estate. and your goals become a reality.